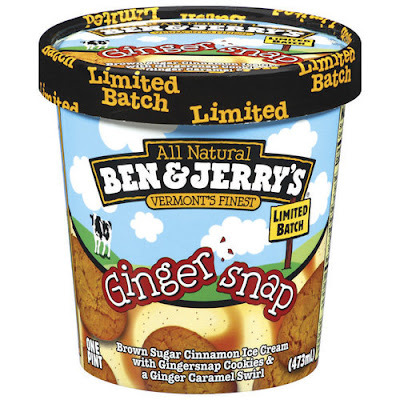 Tagline: We've packed this limited batch pint full of gingersnap deliciousness to titillate your taste-buds and fill your belly with wintertime goodness. And when we say "limited," we mean it, so seize the flavor (or a freezer-full) while you can. Ingredients: Water, Condensed Skim Milk, Liquid Sugar, Corn Syrup, Sugar, Unbleached Unenriched Wheat Flour, Egg Yolks, Butter, Sweetened Condensed Skim Milk, Brown Sugar, Soybean Oil, Molasses, Ginger Juice, Spices, Guar Gum, Salt, Carrageenan, Natural Flavors, Sodium Bicarbonate, Cinnamon.